This tourist attraction on the busy Sukhumvit Road always catches my attention whenever I take the skywalk from Chitlom BTS train station to Siam Paragon. It's called the Erawan Shrine and is often adorned with yellow flowers for offerings.There are always Thai performances held here such as Thai traditional dance. 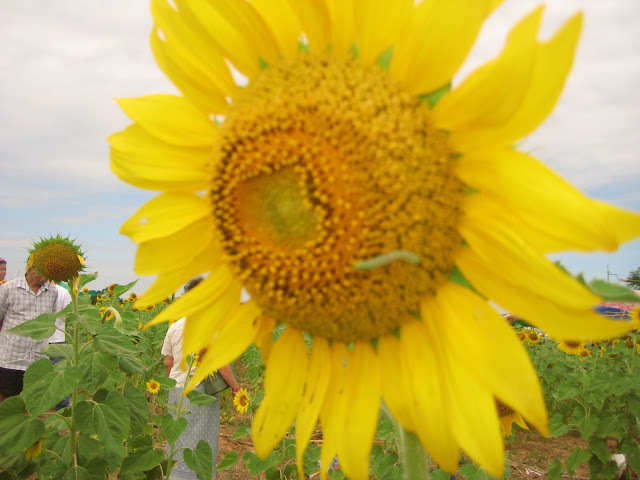 For more interesting posts on Mellow Yellow Monday, click here. We used to feel the cold breeze of Christmas starting early November but climate has really changed so we're still waiting for the chilly air at this Christmas season to come soon. Anyway, it's good to see Christmas symbols around, at least, as there's no Christmas celebration or holiday here in Thailand except for New Year. About 95% of Thailand population are Buddhists. 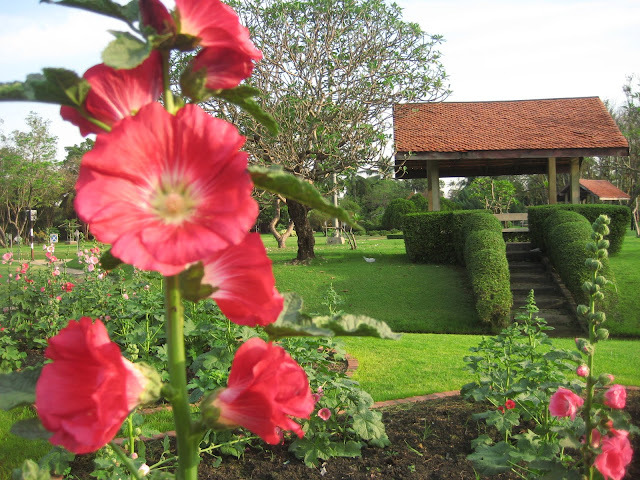 But even if Thailand is a Buddhist country, we can feel the Christmas atmosphere by the fabulous Christmas decors around like these poinsettia plants at the parks and establishments anywhere. Poinsettia is a tropical plant with bright RED leaves that look like flowers and it blooms on Christmas season.Some people call it Christmas plant. This is a towering Christmas tree (about 3 floors in height) at Zen and Central World, downtown Bangkok. It looks rather dull at daytime, especially without a touch of red, the dominant color for Christmas (maybe not yet completed). As it's not yet December, Christmas tree is still rare but next month, we can see spectacular well-decorated Christmas trees everywhere in Thailand. 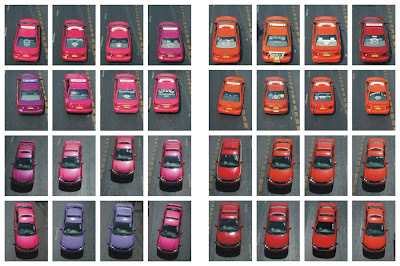 My two kids don't want to take the usual yellow taxi they are used to back home so we always have to wait for any other colors. 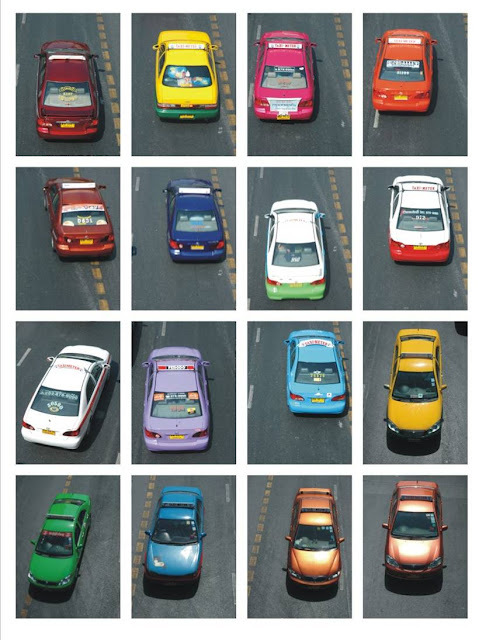 Their favorite taxi colors include blue, pink, purple, orange and green. 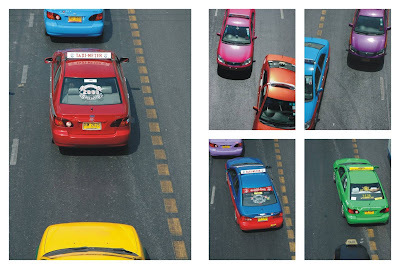 Thanks to Chris, my German friend who is an architect, designer and a photography lecturer at the School of Architecture and Design of KMUTT for all these professionally shot photos of colorful taxis here in Bangkok. 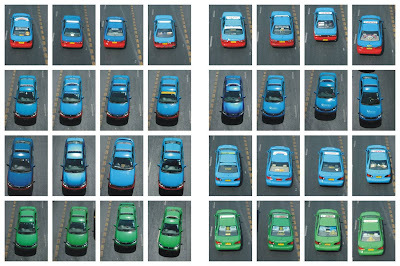 He himself is greatly fascinated with such a colorful sight especially when various colors of taxis come close together during a traffic jam. They all look so bright decorating the roads in Bangkok. 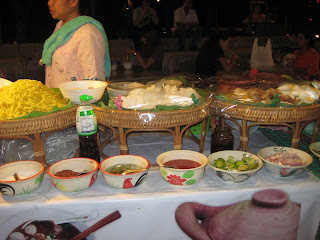 Somtam with raw crabs, anyone? Have you ever tried eating raw crabs? Here's an exotic food loaded with chili you wanna try - Somtam! In my previous post, I featured my favorite Somtam Polamai (mixed fresh fruits) but this time, it's Somtam Malaku (papaya) mixed with carrots, string beans, tomatoes, -all raw, fresh and crunchy! It's seasoned with nam phla (fish sauce) manaw (lemon) juice, Thai caramel from sugary palm and spiced up with garlic and tons of chili as you wish. Then choose your flavor - salted egg, dried small shrimps, salted or preserved freshwater crab which my Thai friend calls "rotten crab". Or if you dare, try raw sea crab. This is the most expensive kind of somtam as sea crab is rare.The ingredients are mixed together while being pounded in a mortar and pestle so the raw crab's fresh juice is blended well to give a distinct taste. I haven't tried it though as I don't eat crab even if it's cooked. 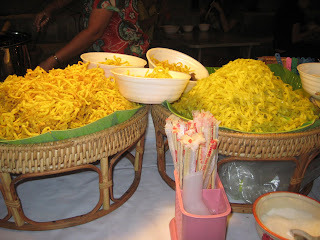 For me, I choose vegetarian somtam mixed with roasted peanuts or salted egg or both. When I order, I always say "maisai prik" or "don't put any chili" but still they put one or two because to Thai people, no chili means "tasteless". But my tongue can now tolerate a chili or two as I already get used to it. Somtam is loved not only in Thailand but everywhere in the world where there is a Thai restaurant. It's not only due to its great taste but also because of its high nutritional value and antioxidant properties. 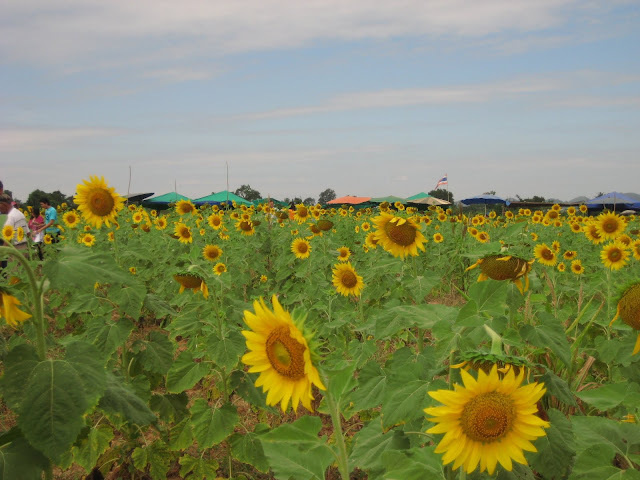 Thailand is a tourist haven as it offers not only its interesting cultural heritage and unique attractions such as amazingly built temples but also delectable food and traditional products. 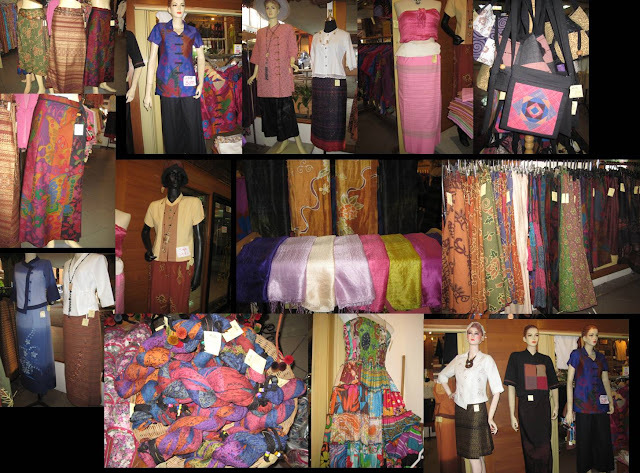 Compared to the prices in Bangkok when buying Thai local products, you can buy Thai-style dresses, bags, scarfs at low prices in Chiangmai right at Lotus Hotel Pang Suan Kaew's ground floor. 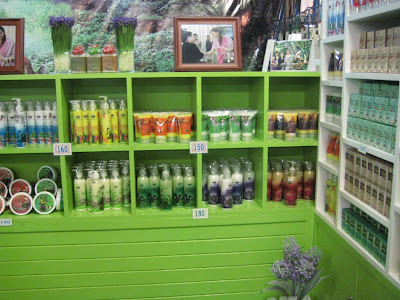 When I checked at the night bazaar, the prices are two or even five times higher especially when you speak English. The dresses above, for instance, can be purchased for only 280-950 baht, FIXED price so no overpricing for "farangs" (foreigners). 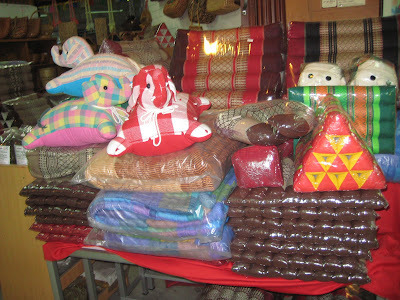 The Thai silk scarf is only from 120-250 baht compared to 250-500 baht of the same quality sold at any other shops here. 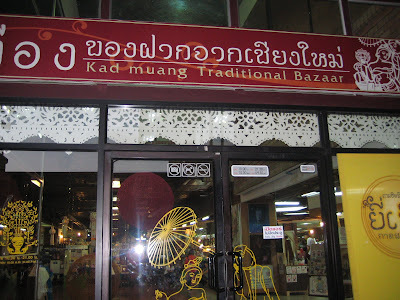 It's at Kad Muang Traditional Bazaar where farangs are treated equally as local shoppers. Go to other shops and when you speak dollars, the price also becomes dollars. See? Lots of "farang" shoppers are going there. 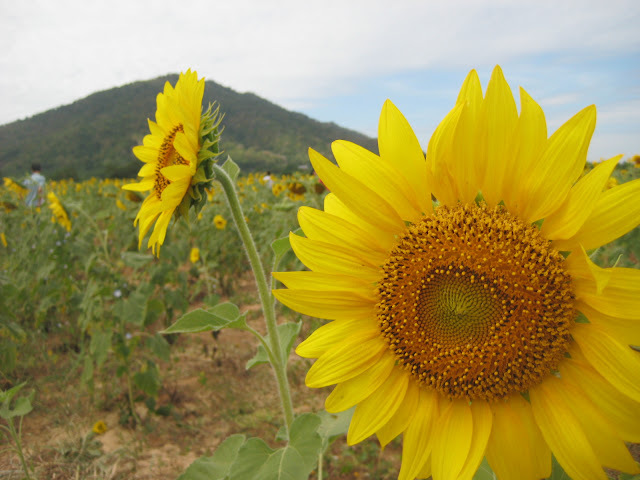 As I promised to have a series of posts about interesting things in the north of Thailand, here I go on with it. Here's a great place to stay in case you have the chance to travel to the north. I and my team were booked at Lotus Hotel Pang Suan Kaew which offers a very low rate ranging from ranging from 1,180 (US$37)-2750 ($86) baht per room including ABF. 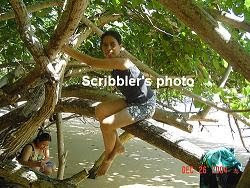 But the main reason my Thai colleagues chose it was its perfect location and amenities. 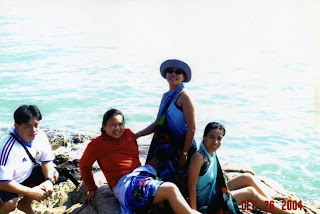 Last year, we stayed at a Thai-style hotel away from the city so we had to spend much for the transportation in going downtown especially to the night market, restaurants, massage parlors and the internet. 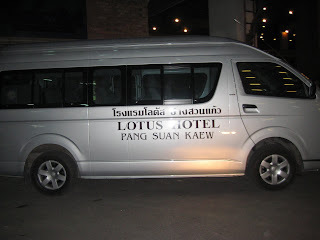 Lotus Hotel has pickup service from the airport to the hotel (for FREE!) so it's quite convenient for us. 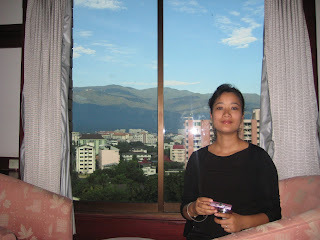 You will also feel relaxed with the cool view overlooking the beautiful mountain from your room. 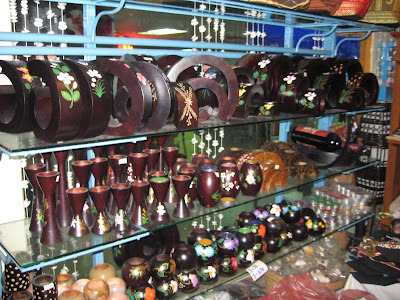 And for tourists who love to shop for local or Thai products, a bazaar that has a wide variety of quality but inexpensive goods is just on the hotel's ground floor. 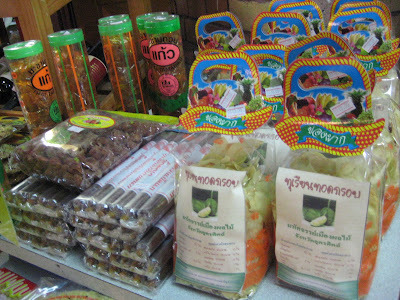 Check out in the next posts what these interesting Thai or local products right at the hotel are. Central Department Store is also a walking distance away in case you need something. For those who want to connect to their loved ones while away from home, a nice but cheap internet cafe that opens until 2:00 AM is just around the corner. 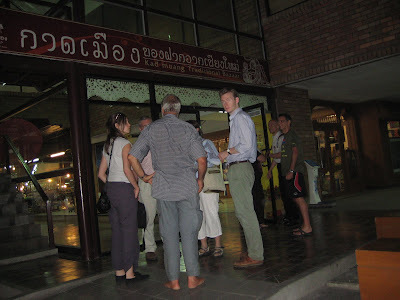 The hotel also offers a ride for only 20 baht per person going to the night bazaar downtown. 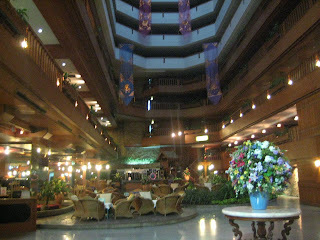 Although the hotel is not new and the buffet breakfast is not that excellent compared to other hotels in Chiangmai, the service is good, the rooms are clean and well-decorated, the price is fair and the location is really traveler-friendly. 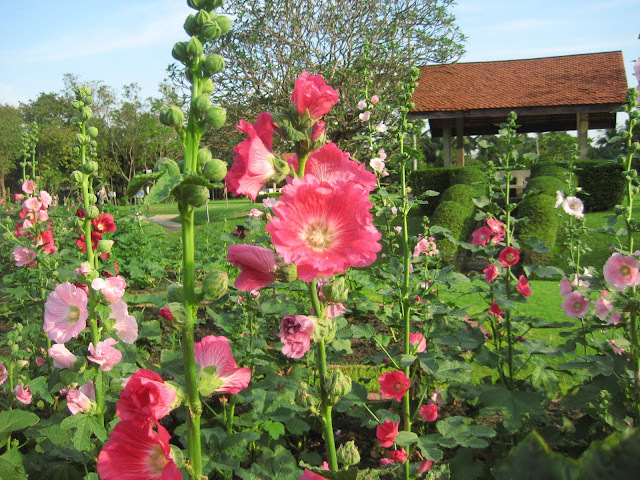 While I was in Chiangmai in the north of Thailand last week, I enjoyed looking around for what is unique in there. 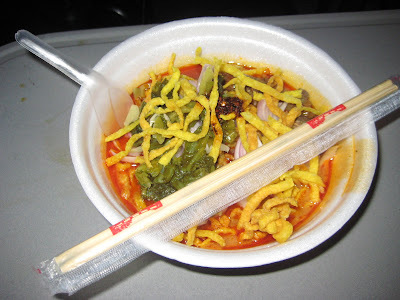 My Thai friends brought me to the night market and here's the food they let me try - Khao soi. 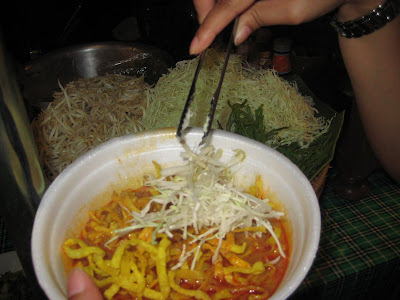 "Khao" means rice and "soi" is a northern term for the spicy curry with coconut milk that is mixed with the yellow noodles (shown on the left photo). You may have a choice between "nuea" (beef) or "kai" (chicken). 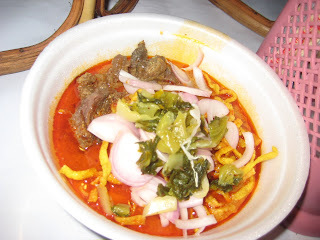 As a beef-lover, I chose khao-soi-nuea. The curry is rather spicy but you can mix it with a lot of raw sprouted mung (mongo) beans and sliced cabbage then squeeze manao (lemon) into it to balance the taste. Now pick extra spices in case you're not contented with the tons of chili in the curry. 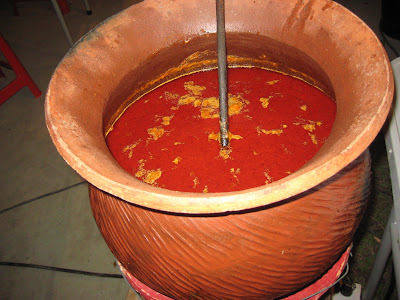 There you are, so aroi (yummy)! Eat it with chopsticks. 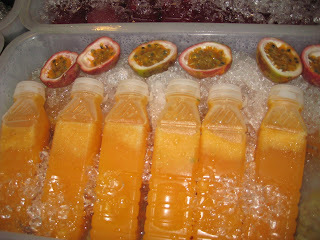 In case you can't bear the fiery taste, cool yourself with chilled fresh passion fruit juice famous in the north. Is floating a krathong only for lovers? 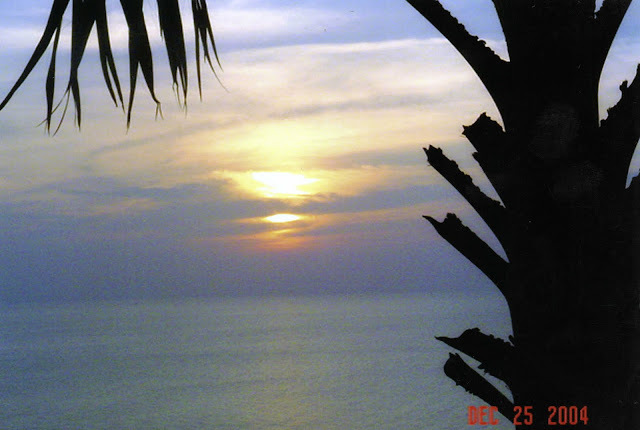 On the full moon of the 12th Thai lunar calendar, usually November, Thai people float a krathong. Some Thais put cut nails or hair into the krathong to drive away bad luck and troubles, incense sticks to drive evil spirits and some money to wish good luck. To Thai people, water means life so floating a krathong unto the water signifies thanksgiving for the blessings water brings to them. Mom and daughter are lighting the candle in their krathong. Dad is saying a prayer or making a wish for his krathong while his son is waiting to help him float his turtle-shaped bread krathong. 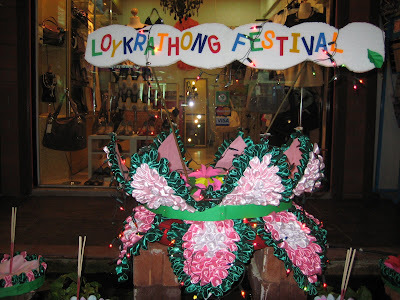 It is said that loy krathong is meant for lovers who wish for a lasting and happy relationship. 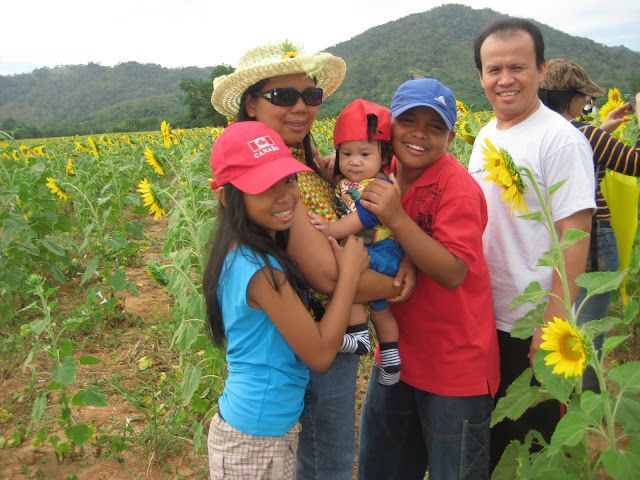 And so Thai families don't miss floating a krathong. Even high school sweethearts do have their own wish, too. Look at their hands! There you are. The krathong is now released unto the water.